The Federation numbers some one hundred members, amongst whom feature the most emblematic brands on the global stage. It comprises three Chambres Syndicales or central bodies (Haute Couture, Couturiers' and Fashion Designers' Ready-to-Wear, Men's Fashion). The Fédération de la Haute Couture et de la Mode brings together fashion brands that foster creation and international development. It seeks to promote French fashion culture, where Haute Couture and creation have a major impact by combining traditional know how and contemporary technology at all times. It contributes to bolstering Paris in its role as worldwide fashion capital. To be an actor committed on behalf of its members and in coordination with them. It expresses, both in France and on the international scene, a strategic, economic, technological, cultural and even political vision of fashion and creation. As a core element of an ecosystem resolutely geared towards the future, the Federation lies at the heart of the fashion industry's changes and challenges. It coordinates whilst it can also be engaged in meetings and conferences, strategic thinking and standpoints. To provide members of the Federation with a range of services that relate to legal, social, economic, technological, marketing and communication issues and that are more generally relevant to the entire spectrum of business functions as a whole. This support is offered via dedicated commissions, ad hoc task forces or individual appointments with brands. 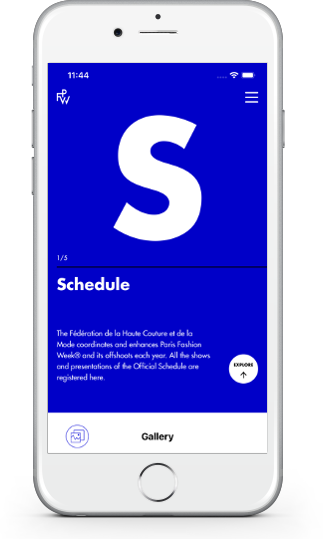 To coordinate and enhance Paris Fashion Week® and its offshoots, including the official calendar of shows and presentations bringing together over 150 brands with recognized uniqueness. Brand applications are examined by a selection committee that guarantees the quality and diversity that are specific to Paris Fashion Week®, a moment of creative abundance and an unmissable economic event. To accompany the development of emerging brands by granting them financial and organizational support, and broadly speaking the overall expertise they need to structure and ease their development and exposure. The Federation organizes a showroom, Designers Apartment, with the backing of the DEFI, a committee for the promotion and advancement of clothing industries. It also has a digital platform, New Now. It actively takes part in the expansion of the French and international ecosystem. To train in traditional and new skills in the fields of creation, management and know-how. The Federation founded and manages the Ecole de la Chambre Syndicale de la Haute Couture and is a founding member of the IFM. These two institutions are today committed to a process of strategic rapprochement. It accompanies fashion-related training as a whole and lies at the heart of thought on tomorrow's occupations.